What were the Elgin Marbles? In a way the story of the Elgin Marbles reflects various modern dogmas. What is "cultural heritage"? Does it belong to producers--or to the admirers who appreciate and are influenced by it? . . . Perhaps the "heritage of man" deserves the widest audience possible. Lord Elgin's acts (and later the British Musuem's) helped preserve the art and, therefore, the British Musuem has a right to them because their labors preserved the marbles and gave them added (much added) significance. The art should be displayed in a place where the most people can benefit from them. Now that's an argument with some interesting results if we start applying it broadly in property law.... And a topic on which I hope to say a little more about in the context of Hawaiian antiquities shortly. Endnotes: For some other thoughtful commentary, see the Thomas Ulen, Robert Cooter website, and Eric Gibson's piece from the WSJ from last December. 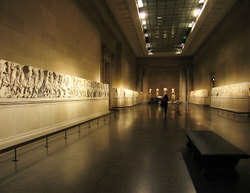 The public domain image of the Elgin Marbles in the British Museum is courtesy of our friends at wikipedia. As with so many of my posts on cultural property, a special thanks to my colleague Carl Christensen. Comments are held for approval, so they will not appear immediately.